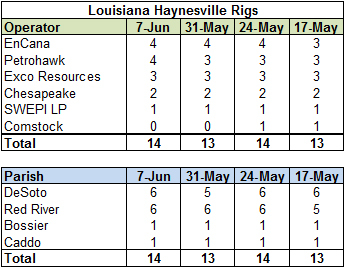 This week's Haynesville Shale rig count was unchanged at 25, with Louisiana holding at 15 rigs and Texas unchanged at 10 rigs. 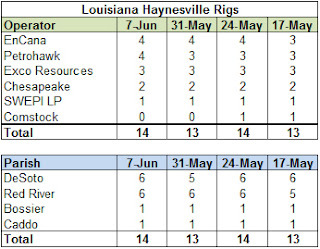 In Texas, Anadarko was down one rig and EOG Resources is back on the board with a new rig for the first time since late March. 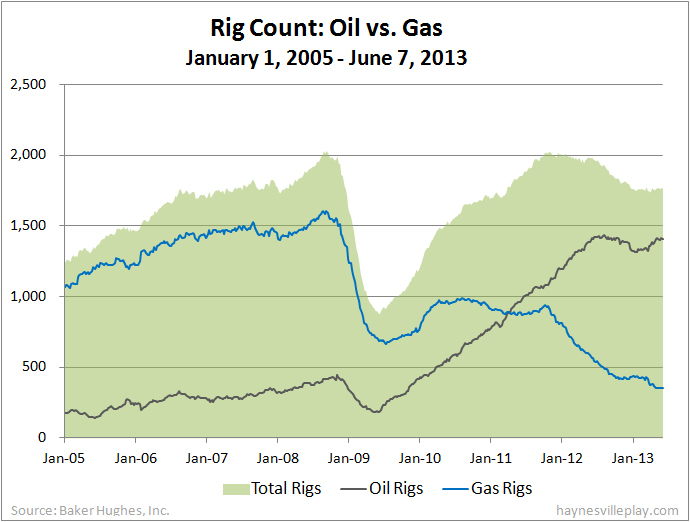 The Baker Hughes U.S. rig count was down 11 this week to 1,748, the lowest level since April 5. Oil rigs were down 15 to 1,390, gas rigs were up four to 353 and miscellaneous rigs were unchanged at five. By type, horizontal rigs were down 12 to 1,067, vertical rigs were up three to 441 and directional rigs were down two to 240. Among gas rigs, horizontal rigs were down two to 245, directional rigs were up seven to 70 and vertical rigs were down one to 38. The storage injections keep climbing - so much for the big cushion earlier this year! 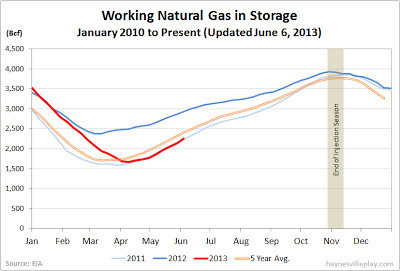 The EIA reported that working gas in storage increased 95 Bcf last week to 2.533 Tcf. The weekly injection was 64% higher than last year (+58 Bcf) and 20% above the five year average (+79 Bcf). The current storage level is now 17.1% below last year (3.055 Tcf) and 1.2% below the five year average (2.564 Tcf). 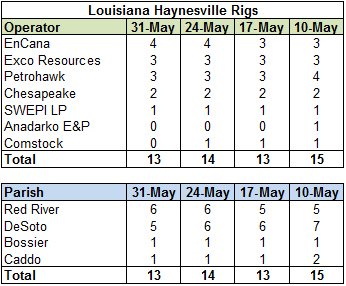 The Haynesville Shale rig count increased by two this week to 25. 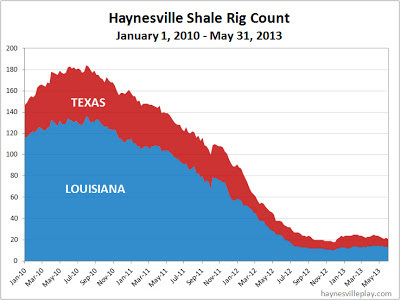 Louisiana was up one (EXCO Resources) to 15 and Texas was up one to ten (XTO Energy). By type, horizontal rigs were down seven to 1,079, vertical rigs were down three to 438 and directional rigs were down two to 242. 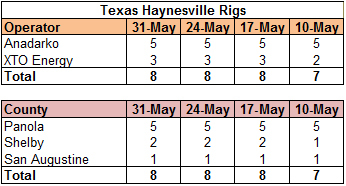 Among gas rigs, horizontal rigs were up one to 247, directional rigs were down two to 63 and vertical rigs were down three to 39. 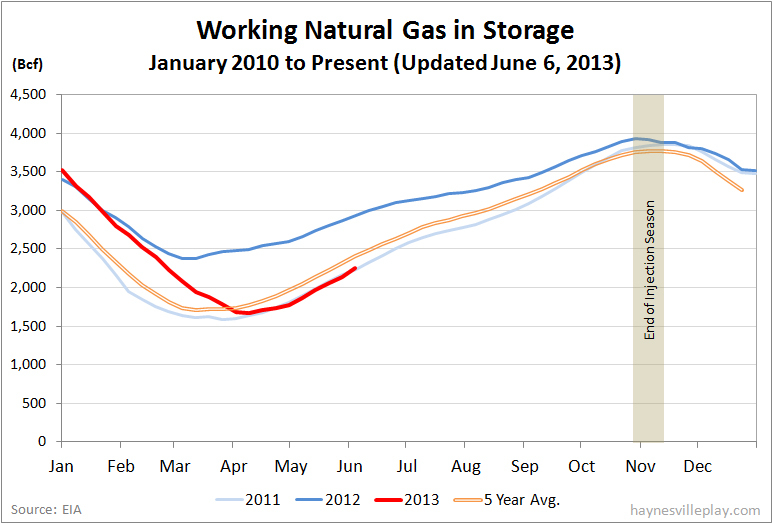 The EIA's working gas in storage report shows a 91 Bcf increase this week, bringing the total working gas in storage to. 2.438 Tcf. The weekly injection was 44% greater than last year (+63 Bcf) and 14% higher than the five year average (+80 Bcf). The current storage level is now 18.7% below last year (2.997 Tcf) and 1.9% below the five year average (2.485 Tcf). 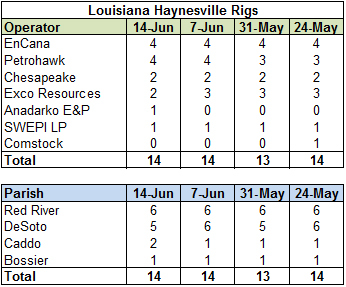 The Haynesville Shale rig count was unchanged this week at 23. Louisiana and Texas held at 14 and nine, respectively, but Louisiana saw EXCO down one rig and Anadarko back on the board with one. EXCO now sits with two operating rigs in the Haynesville Shale, its lowest level since I started tracking rigs in January 2010. The Baker Hughes U.S. rig count is up six rigs this week to 1,771. Oil rigs are up seven to 1,413, gas rigs are down one to 353 and miscellaneous rigs are unchanged at five. 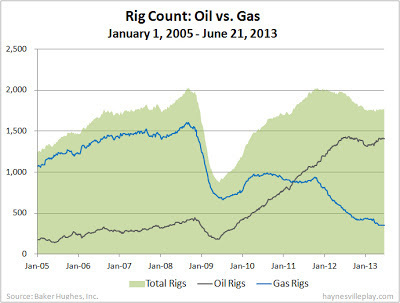 By type, horizontal rigs are down two to 1,086, vertical rigs are up two to 441 and directional rigs are up six to 244. Among gas rigs, horizontal rigs are down five to 246, directional rigs are up three to 65 and vertical rigs are up one to 42. The EIA reported another big natural gas storage injection this week, up 95 to 2.347 Tcf. The weekly injection was 44% greater than last year (+66 Bcf) and 13% larger than the five year average (+84 Bcf). The current working gas in storage level is 20.0% lower than last year (2.934 Tcf) and 2.4% below the five year average (2.405 Tcf). The current level is now only 58 Bcf below the five year average, a differential that has been shrinking for weeks. The Haynesville Shale rig count was up two this week to 23. Louisiana was up one (Petrohawk/KCS) to 14, while Texas was up one (Valence) to nine. The Baker Hughes U.S. rig count was down six rigs this week to 1,765. Oil rigs were down four to 1,406, gas rigs were unchanged at 354 (for the fourth straight week!) and miscellaneous rigs were down two to five. By type, horizontal rigs were down one to 1,088, vertical rigs were down 11 to 439 and directional rigs were up six to 238. Among gas rigs, horizontal rigs were up one to 251, directional rigs were up four to 62 and vertical rigs were down five to 41. The EIA did a nice little "lookback" at this past winter in the context of natural gas that showed temperatures returning to historical averages, production edging up a bit and consumption starting to return to normal levels across previously depressed sectors. I won't regurgitate it here - take a look at it - it's a pretty quick read. The EIA natural gas in storage report showed a 111 Bcf net increase in storage, bringing the total working gas in storage to 2.252 Tcf. The weekly injection was 76% greater than last year (+63 Bcf) and 21% larger than the five year average (+92 Bcf). 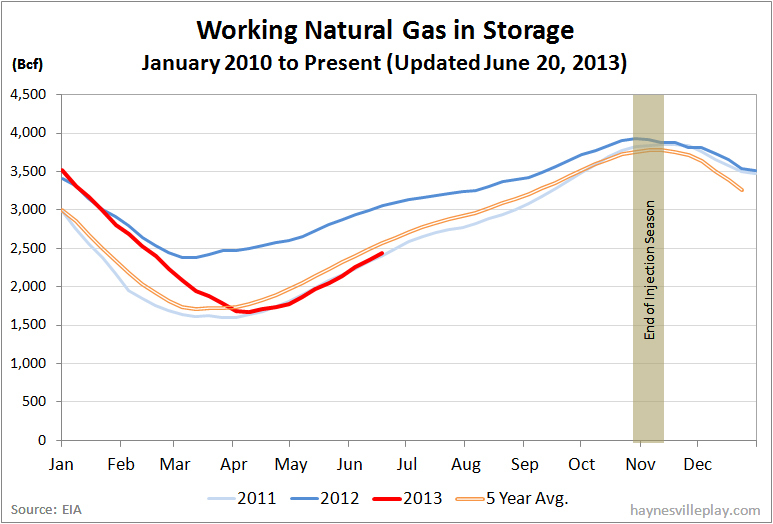 The current storage level is now 21.5% below last year (2.868 Tcf) and 3.0% below the five year average (2.321 Tcf). The deviation between current storage levels and the five year average has been narrowing over the past five weeks as current injections continue to equal or surpass average injections, as shown below. The Haynesville Shale rig count was down one rig this week to 21. 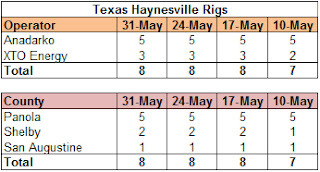 Louisiana was down one rig to 13 (Comstock), while Texas held at eight.